Enable it if your wheel pulls in the wrong direction. Filters out peaks in the FFB, for example when driving over big kerbs. Increase it if you think your wheel makes too much noise over kerbs. Decrease it if you think the FFB feels washed out. Adjusts the forces generated from cornering. Increase it to make the wheel stiffer and to get more feedback when the car is oversteering. Decrease it if you experience clipping. Controls how light the wheel will get when understeering. Decrease if you loose force too quickly when entering a corner. Increase if you can´t feel the grip loss when entering a corner. Controls how strong vertical forces on the tyres are reflected in the FFB. Mostly used to feel bumps on the road. Increase to feel more details of the driving surface. Decrease if bumps are too strong. Controls how strong lateral forces on the tyres are reflected in the FFB. Increase to make the wheel stiffer. Decrease if the FFB looses too much detail (clipping). Choose how much of the lateral forces are calculated using the steering rack of the car instead of the tyres. Increase to get more feedback from the engine. This setting does not affect forces coming from 3D kerbs (use vertical load & smoothing to adjust that). Adjusts how strong the kick from shifting is. In the secondary controller settings you will find an option to bind a key for the FFB Meter. 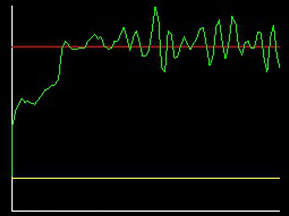 Once enabled, the yellow line marks your minimum force setting, and the red line shows the maximum force. 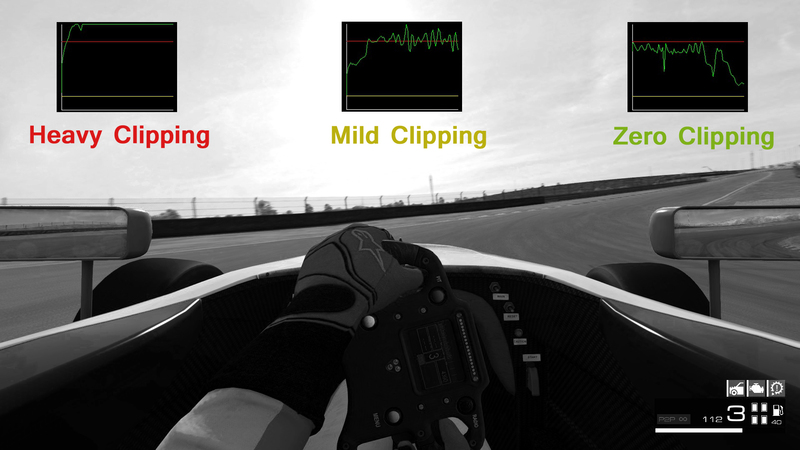 The green graph displays the steering forces sent to your wheel. If the graph exceeds the red line you are experiencing "Clipping"
Clipping means, that your wheel has reached the maximum output force and you won't feel any difference above that limit. 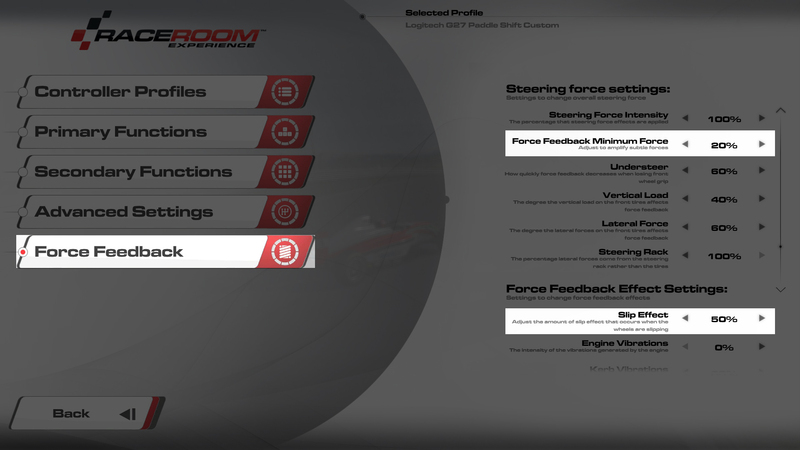 The minimum Force Setting can be found in the FFB Settings Menu, and will allow you to amplify all the small FFB forces that your wheel might not be able to put out. That means small bumps and steering forces will be increased to a point where you can actually feel them through your wheel and thereby adding more details to your FFB. This will also help eliminate the "dead center feeling" occurring with some of the wheels. which occurs for example during wheelspin, understeering, sliding and even on heavy braking. Depending on the amount of grip as well as the rotation speed of your tires you will feel a vibration indicating that your tires are slipping. The more grip your tires loose, the higher the amplitude of the vibration will be. This will deal with the problem of wheels rotating by themselves if the car is stationary, for example in garage or on the starting grid. This won't be an option you will find in the menu, and it only takes effect, if the car moves slower then a couple of meter per second. Since the FFB in R3E is based on the car physics (Tire load & grip + suspension geometry), different cars result in different FFB strength. So in the past you might have found your perfect FFB settings for one car, only to find out they don't work as well with another car. To avoid this, you are now able to adjust the cars individual FFB strength by changing the FFB Multiplier. You will find this new Setting in the Car Setup>Steering Settings. Increase the FFB Multiplier if a particular car feels too weak. Decrease it, if the FFB of the car is causing heavy clipping. 1. Start by choosing the new default profile for your wheel in the Controller Profiles Menu. It contains presets for all the new settings. 3. Depending on the Wheel you own, choose how much Clipping you want to allow. If you for example own a Logitech G27, you should aim for Mild Clipping values, in order not to loose too much of the overall FFB Strength. If you own a high end, direct driven wheel you can easily set it up for Zero Clipping, for the maximum amount of detail. Could you explain the Steering Rack setting more clearly? I generally understand the other settings but this one has been a complete mystery to me and the above description doesn't really explain much. 100% steering rack would mean that all lateral forces will be calculated using forces from the steering rack. Dont know how else to explain it. It´s probably easier to just experiment with it, and see what feels best to you. It´s not a very intuitive setting, that doesn`t make a whole lot of difference anyway. We might get rid of it in the future as it seems to confuse people. Thanks. I still don't understand what the difference between forces through the tires and forces through the steering rack would be. I have experimented with it and I feel very little (if any) difference between zero steering rack and 100 steering rack, so I usually just leave it at zero. Thanks for responding, keep up the good work. Thanks Georg, nice clear explanation Do you think you guys will be able to add a 'clipping meter' in the future? Let´s see what the future brings. "Georg Ortner" Any plans about adding an online-chat in the Multiplayer section? yeahhh... good and thank's for these informations !!! what do you recommend as parameters in the Logitech Profiler ?? I posted my Profiler settings here! hummm ok... I tested soon !!! I would be great if members posted their individual settings and findings. My Thrustmaster T500 and Logitech G27 seem to react very differently to the settings. Therefore, it would be cool to benefit from other members experiments. Maybe its interesting to set up a hardware thread with sub-divided threads by brand. I put my T300rs profile. Then we can do longer races ,i hope so!! Thanks for the settings explanation!! Is it possible to get Informations about FFB settings with Bodnar Simsteering? I can do what I want but the FFB is terrible with Servo Wheels. 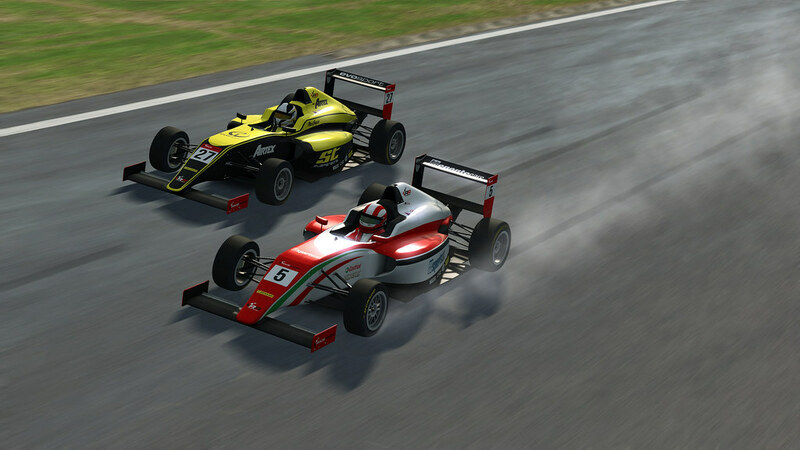 I have many Tracks and Cars but I can not drive them.